They always say we live in such a small world, and that we’re all linked in some way, even by the smallest of events. 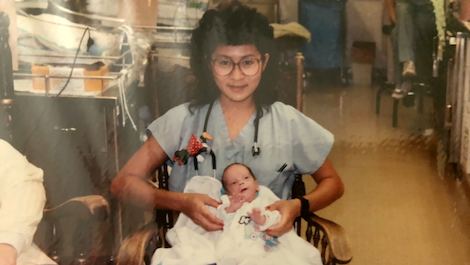 However, for intensive care nurse, Vilma Wong, and her new colleague, Dr Brandon Seminatore, their paths crossed from the first day Brandon came into this world, and Vilma is the reason why he is still here today. 28 years ago, Brandon Seminatore was born into a hospital based in San Jose, California. However, for poor little Brandon, he was born prematurely at 29 weeks old, and needed instant care from a professional. This is where Vilma Wong comes into the story. She had only worked at the hospital for four years before her future colleague was brought to her, back in 1990. Wong became very close to the new-born, as he was in the hospital with her for over a month before he was allowed to go back home. But, all thanks to Vilma, Brandon is alive and well today, and has become very successful in his tracks. Funnily enough, although Vilma couldn’t recognise her patient by face, she did recognise his name, but couldn’t remember where she knew him from. However, Brandon would never forget his life saviour, and fished out a picture of the two from all those years ago. Vilma said that the experience has been life changing, and has made her extremely proud to be in the profession that she’s in. She has seen a critically ill baby, thrive into a doctor, who is now taking care of babies, just like she did with him. We can’t help but think that Vilma had something to do with Brandon’s career choice, but we’re sure that the thousands of families out there are so grateful that she did, as they now have the dream team working together on every case. It goes to show how surreal life can be, and that we should be thankful for every single moment. Did this story warm you heart with joy? Do you think life has a funny way of working out? Let us know in the comments, or on Twitter at @WhatsTrending.